The gray USB to DVI Adapter from C2G provides the capability to extend your viewing options from a laptop or PC. 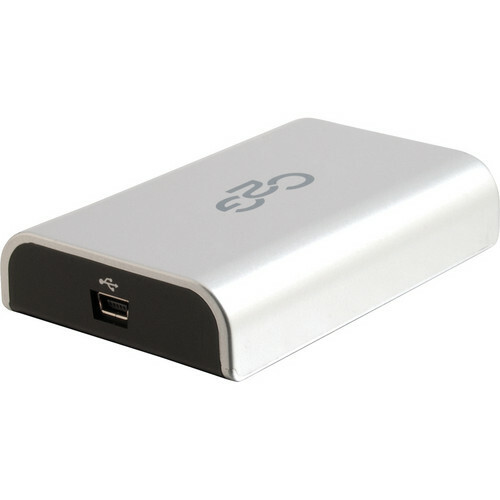 You can quickly and easily connect existing equipment to a VGA or DVI-I enabled monitor or projector using the computer's USB 2.0 port. Enjoy extended, mirrored or primary display modes and allow content to be spanned across multiple displays, increasing productivity while minimizing additional hardware investments. This plug-and-play solution includes an integrated driver that installs quickly and easily for immediate performance. Once the driver is installed, you can use up to six adapters connected simultaneously to a single computer to allow multi-display capability. High definition performance is achieved through resolutions up to 1920 x 1080 pixels and video streaming up to 1080p. With a compact form factor and rugged housing, this unit combines durability with functionality to ensure optimal performance and results. Box Dimensions (LxWxH) 5.9 x 5.1 x 1.1"
USB to DVI Adapter (Gray) is rated 3.7 out of 5 by 3. Rated 1 out of 5 by grayv from windows 10 - Does not support Windows 10, no driver. Rated 5 out of 5 by Snoop from C2G usb to DVI Received this yesterday, hooked up to my laptop with Windows 10, works perfect! Rated 5 out of 5 by Paul from Device works well The device configured quickly in Windows 10 and works well. The only thing to keep in mind is that this is not a stand alone device. Meaning, you must have another graphic device in your computer. This device is only used to extend you display to another monitor.